This weekend, the Valiant 2017 Convention Tour is stampeding into FAN EXPO DALLAS – and we’re bringing along a herd of merchandise, programming, panels, and the best-reviewed comics in the industry! From Friday, March 31st to Sunday, April 2nd, visit the Dallas Convention Center at booth #631 for an all-access tour of the best superhero universe in the business, with a complete selection of Valiant trade paperbacks and deluxe hardcovers for award-winning titles, including BLOODSHOT REBORN, BRITANNIA, DIVINITY, FAITH, NINJAK, QUANTUM & WOODY and many more! And don’t miss the bundles of Valiant merchandise exploding out of Dallas, including t-shirts and more! Then, come celebrate the silver anniversary of one of comics’ most enduring icons on Friday, March 31st, at 7:00 p.m. CT in Room C146 for the VALIANT: 25 YEARS OF X-O MANOWAR panel presentation! This March, Valiant celebrates 25 years of its most enduring comic book icon as best-selling writer Matt Kindt and a rotating cast of powerhouse interior artists launch a stunning new beginning in the all-new X-O MANOWAR (2017) #1! Now, right here at FAN EXPO DALLAS, join a blockbuster roundtable of Valiant’s greatest talents for an in-depth discussion of X-O Manowar’s landmark place in comics history…and a special look forward at the must-read new series of 2017! Plus, prepare for all-out warfare on Saturday, April 1st, at 4:00 p.m. CT in Room C146 for the VALIANT: THE ROAD TO HARBINGER WARS 2 panel presentation! The road to Valiant’s biggest, most ambitious and most impactful comic book event of all time starts right here at FAN EXPO DALLAS with a superstar cast of Valiant creators and staff! Jump on board here to find out what the future holds for HARBINGER RENEGADE, X-O MANOWAR, BLOODSHOT, FAITH, DIVINITY, NINJAK, and the rest of Valiant’s most powerful heroes…and how the coming of HARBINGER WARS 2 will soon be felt across the entire Valiant Universe with never-before-seen artwork and announcements! We’ll see you in Dallas! 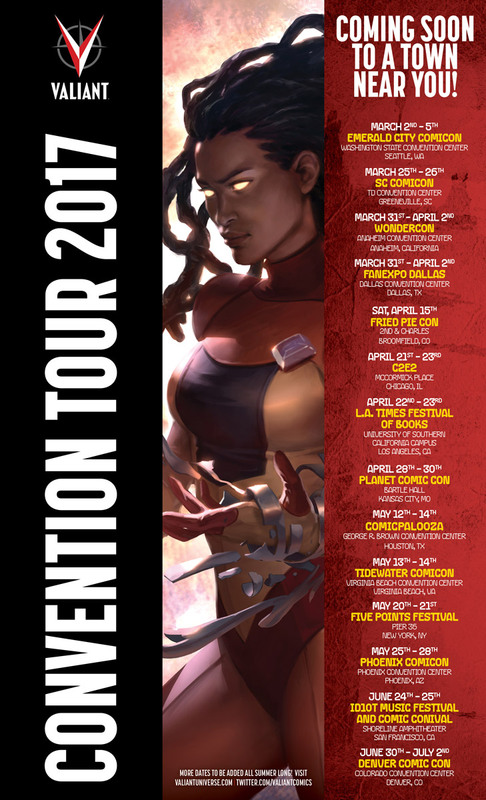 And don’t miss a moment of the action as Valiant’s one-of-a-kind convention road show marches on through Broomfield, CO; Chicago; Los Angeles; and more throughout the spring!